As one of the largest retailers in the United States, employing almost 350,000 full-time, part- time and seasonal employees, Target works with strategic partners to reach the goal of elevating the lives of at least three million people in the factories and communities where Target’s goods are produced, deepening its commitment to identify and, if discovered, eliminate forced labour in its supply chains. This case study is based on the 2018 Corporate Responsibility Report by Target published on the Global Reporting Initiative Sustainability Disclosure Database that can be found at this link. Through all case studies we aim to demonstrate what CSR/ ESG/ sustainability reporting done responsibly means. Essentially, it means: a) identifying a company’s most important impacts on the environment, economy and society, and b) measuring, managing and changing. In its 2018 Corporate Responsibility Report Target identified a range of material issues, such as diversity & inclusion, product safety, community development, responsible resource use, waste management. Among these, preventing forced labour in its supply chains stands out as a key material issue for Target. To identify and prioritise material topics Target worked closely with internal working groups to prioritise the environmental and social topics of concern and also carried out a survey among external stakeholders, to hear their feedback and expectations. 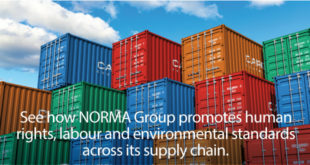 What actions were taken by Target to prevent forced labour in its supply chains? Target’s CEO Brian Cornell sits on the Board of Directors of the Consumer Goods Forum, and Target has adopted the organisation’s Resolution on Forced Labour. The resolution is the first industry commitment of its kind and contains the adoption of three key principles: that every worker should have freedom of movement, that no worker should pay for a job, and that no worker should be indebted or coerced to work. Target has developed policies for its suppliers to protect foreign contract workers in its supply chain. Target seeks to set clear expectations for suppliers and lay out procedures, standards and verification mechanisms that will support the adoption of the Employer Pays Principle. In 2017, Target joined the Responsible Labour Initiative’s Steering Committee, to continue to develop cross-industry approaches for advancing labour practices, especially regarding responsible recruitment and the protection of foreign migrant workers. 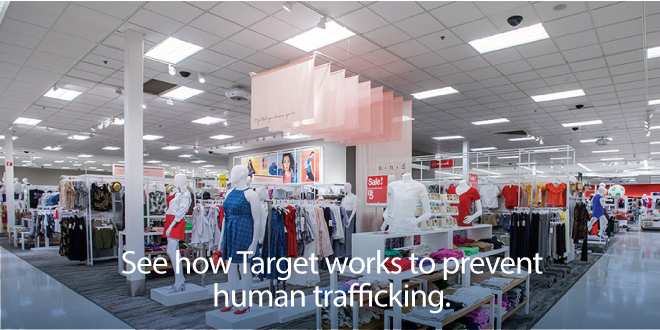 In 2017, Target launched a pilot programme to prevent human trafficking in Northern India. Workers from eight factories and 10 communities participated in a survey that informed both digital informational messaging and local non-profit partners’ educational programmes. By carrying out awareness programming prior to migration, Target hopes to help address the needs of community members and reduce the likelihood of trafficking. In addition, Target entered into a partnership with the International Justice Mission (IJM), to implement the group’s Safe Migration Programme and Grassroots Prevention Campaign in India. These programmes aim to prevent labour trafficking and support trafficking survivors by engaging with vulnerable communities and local authorities. All handwoven rugs produced for Target in India are certified by GoodWeave, as child labour free. In 2017, Target continued partnering with GoodWeave to further develop a technology platform that will enable end-to-end supply chain mapping and monitoring for child labour risks in Target’s supply chain in North India. Note to Target: With each case study we send out an email requesting a comment on this case study. If you have not received such an email please contact us.